If you are looking for an indoor and outdoor app-controlled quadcopter with 7-10 minutes flight time, you want to consider the Parrot AR 2.0 Elite Edition (Sand). It is an excellent quadcopter for a beginner and has enough features for an intermediate pilot. This quadcopter is for age 16 years and up. While someone younger might be able to fly it, it is just a little pricey for the kids at that age as they tend to break things more quickly. The video is 720p HD at 30fps, this camera is good enough that you can post great pictures on social media, but it not really professional quality. One of the most important things about a camera drone is the ability of the drone’s flight control to provide a stable platform for the camera. The Parrot AR 2.0 Elite has a 3 axis gyroscope, a 3 axis accelerometer, 3 axis magnetomer and an extra downward facing camera. The downward facing camera and ultrasound sensors are used by the on-board flight controller to maintain altitude stability. 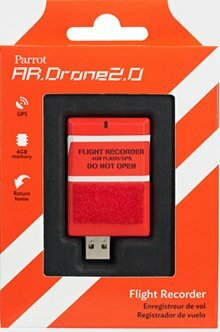 The Parrot AR 2.0 Elite is well designed for both indoor and outdoor use. Shells are EPP (expanded polypropylene), which makes them very resilient and durable. It comes with two shells, one for indoor use and one for outdoor use. The indoor shell has blade protectors and the outdoor shell does not have the blade protectors. We suggest that you use the indoor shell at first to save on the cost of replacement propellers. Record flight video directly on your smart device to share quickly and easily. This is an app-controlled quadcopter, use your smart device (any of the followings) to control this quad copter easily. Ground control unit (Not included). Use your smart device to control this quadcopter. Range is limited to a little over 150 feet. Overall Rating for Parrot AR 2.0 Elite Edition : 9/10 for an app-controlled camera drone in the $200 range. If you get the optional GPS Flight recorder, you get flight planning and GPS Return to Home. The use of smart phones over WIFI means that this quadcopter’s range is limited to about 150 – 170 feet. The Parrot AR Drone 2.0 Power Edition is an indoor and outdoor camera drone – it comes with one indoor hull and one outdoor hull. This is a RTF app-controlled drone, you only need to connect the battery, download AR’s Freeflight 2.0 app, you are ready to fly. The default flight mode setting is set for beginner skill. You can easily change the piloting mode (via the Freeflight app) to suit your flying style. If you are a beginner, you would love its flip and barrel rolls by just hitting a button. The Parrot AR 2.0 Power Edition allows you to fly as far as 165 feet away. Two 1500mah batteries are included. The pressure sensor will automatically correct and maintain a steady position in the air even in wind speed up to 15 mph. Camera: 720P 30fps HD camera, wide-angle lens 92° diagonal. Flight Control: using your iOS or Android device. From the extended battery life of 36 minutes of flight time, HD camera, live video streaming to its intuitive flight control app, the Parrot AR 2.0 drone camera is definitely worth this affordable price point. Quick Tip: If you have an Nvidia Shield portable gaming device, you can use it to control the Parrot AR Drone 2.0 Power Edition with its physical sticks. The Parrot AR 2.0 Elite Edition (View on Amazon) is a great buy in its class and price range. It is easy to fly, FPV via your smartphone. The AR FreeFlight app displays functional status such directional control and camera control. It is easy enough to use for a beginner and has enough features for an intermediate pilot. It is well designed for both indoor and outdoor use, including two durable shells, one for indoor use and one for outdoor use. The Parrot AR 2.0 Elite provides a stable platform for smooth videos via its 3-axis gyroscope, 3-axis accelerometer and 3-axis magnetometer. Its downward facing camera and ultrasound sensors are used by the on-board flight controller to maintain altitude stability. The 1280 X 720p videos look very nice when posted to social media. If you don’t tell them, your friends will see the video clips and think that you are flying a lot more expensive quadcopter. Check out our brand review series on parrot drones.